Effective Protection Or Wasted Space? This adorable little Baby Browning .25 ACP, though impractically small, was surprisingly accurate. I could pop stumps with the tiny little gun at 30 meters or more despite its diminutive chassis and worthless sights. It’s embarrassing to admit, but my first concealed carry pistol back when dinosaurs roamed the plains was an FIE Titan in .25 ACP. We had no money and my precious young wife gave me the $50 handgun as a birthday present. I cherish it still for that reason. An imminently compact single action autoloader, this pipsqueak of a handgun rode loose in my pocket stoked with Glaser Safety Slugs underneath an empty chamber. These novel cartridges drove copper bullet jackets filled with number 12 lead shot. Given the horrid ballistics of this diminutive little cartridge and its inevitably poor penetration I likely would have been better off just throwing the tiny gun at somebody. However, I was technically “packing heat” and it made me feel better when my family and I had to traverse the spaces where the wild things roamed. North American Arms offers a wide array of accessories for their superb little revolvers. Holsters and grips of various sorts, laser sights and sundry bling make a fine last ditch backup gun even better. Our hero was heading out for a night on the town and dropped a Jennings .25 pistol into the right front pocket of his jeans alongside his cigarettes. Later in the evening as he was fishing for his smokes the little gun accidentally discharged. The music was so loud in the sordid that nobody heard the gunshot. Shaken but otherwise unimpeded, the man’s revelry continued until he went home to pass out in a drunken stupor. By noon the following day his left knee had grown sore. I saw him in the ER and an x-ray revealed a deformed .25-caliber bullet resting inside the joint capsule of his knee. The entrance wound was literally, invisible. The orthopedists fished out the round, and the man left to party another day. However, he had gone almost 24 hours, literally without knowing he was shot. As the round had transited from his right front pocket to his left knee, his greatest relief was his manhood remained undamaged. A sweet little old lady ran a small grocery store which was the object of an armed robbery. The bad guy tossed a round from an unknown .25-caliber pistol in her direction as he left the store, just for the sake of meanness. The tiny little bullet caught the hapless woman in the neck and cleanly severed her spinal cord, a structure that, at that level, is about the diameter of your little finger. She survived but will never take another step. While ballistics are important, shot placement is everything. The North American Arms .22 Short mini-revolver looks like it’s scaled for your kid’s action figures. We have all seen them — those adorable little stainless steel revolvers which are ubiquitous fixtures in American gun shops. Meticulously cut from surgical-grade stainless steel, these little single-action wheelguns are just cute as can be. They’re available in sizes ranging from a truly tiny .22 Short version looking like it’s scaled for your kid’s GI Joes, up to convertible variants launching legitimately powerful .22 Magnum rounds. These guns are the pocket pistols you need never be without. They drop painlessly into the front pocket of your pants and weigh just about nothing. The tiniest in .22 Short is simply charming. There is a sighting groove cut in the top strap but the hammer occludes this appendage in both the cocked and released positions. This Lilliputian handgun can indeed chuck bullets but it’s really too small for practical use. It does, however, look genuinely awesome on the wall of my gunroom. My convertible .22 Magnum version, however, is indeed a powerful defensive firearm, particularly when stoked with Winchester PDX-1 defensive rounds. The handgrip pivots to enclose the trigger assembly and makes the gun safe and comfortable pocket fodder. I can have the pistol up and firing out of my pocket in less than two seconds. Recoil and muzzle blast are fairly impressive in .22 Magnum but I can hit fine at appropriate near-contact ranges. Additionally, I use the .22 LR cylinder for range time and the magnum version for social work. Mine is on me literally all the time I am not sleeping or in the shower. 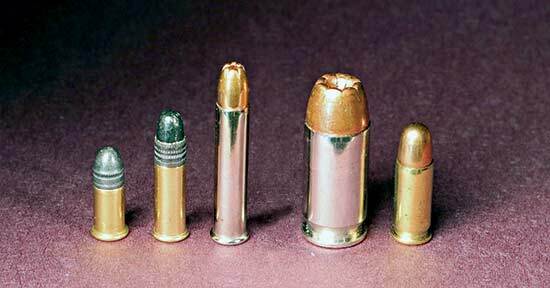 Even with advanced bullets, the .25 ACP cartridge really does not possess enough energy to make it reliably effective. The blue-tipped rounds shown here are the original Glaser Safety Slugs I carried nearly 30 years ago. Soured on the evening’s television fare the gentleman fumbled with and dropped his TV remote. While groping blindly for the device underneath his sofa he came across a previously forgotten .22 pistol. Mightily vexed as to whether or not he had left it loaded, he did what anyone of his comportment, education, breeding, and upbringing might have done. He drew a careful bead on his right big toe and squeezed the trigger. The round center-punched his toenail, passing cleanly through his toe and transiting both the screen and chassis of his television before lodging in the sheetrock beyond. In competent hands a .22 is plenty powerful to kill you. In incompetent hands it can foment a great deal of mayhem as well. They walk among us, my friends. Anyone decrying the .22 Magnum round as inadequate to stoke a backup gun has never shot anything soft and wet with it. When launching appropriate bullets like the PDX1 Defender from Winchester, the .22 Magnum can be fearsome at appropriate ranges. From left to right, a .22 Short, a .22 LR, a Winchester PDX1 Defender round in .22 Magnum, a .45 ACP for size comparison and finally the cute little .25 ACP. In a real defensive encounter you would indeed be better served with your favorite tricked-out M4. However, good luck concealing that as you scoot out to the supermarket late at night for milk and diapers. A .22 or .25 pocket gun is a poor substitute for a Glock 17 but they both are a heck of a lot better than foul language or pleading. Both the FIE Titan and my little Baby Browning will ride painlessly in a front pocket so long as basic safety rules are observed. While the .25 ACP is decidedly marginal, the Winchester .22 Magnum PDX1 Defender round launched out of the NAA revolver, however, is legitimately effective. None of these guns is particularly accurate beyond bad breath range but thus is the nature of a backup gun. Guns such as these are your final option after all else has been exhausted. After half a century of sharing the planet with the sorts of folks who kept my ER hopping, I have come to the conclusion that overkill is just not a real thing.